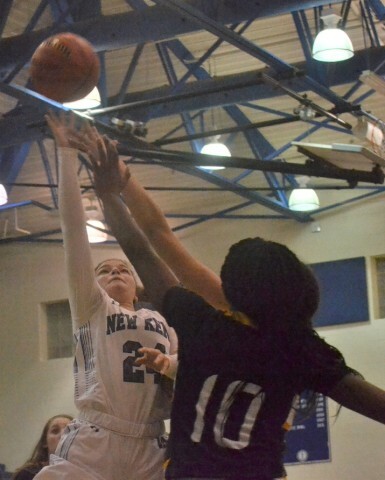 New Kent's Bailee Hellebrant (left) releases a floater over the outstretched hands of Bruton's Alex Warren (10). New Kent’s Lady Trojans home opener faired a lot better than their first contest, thanks to a breakout performance from Bailee Hellebrant. Hellebrant scored 19 points including a barrage of three-pointers to guide the Lady Trojans to a 44-28 triumph over the visiting Bruton Lady Panthers during the Nov. 29 clash. Early on in the contest, Lady Trojan head coach Neko Burson tried to figure out a defense to slow down Bruton’s Jade Robinson, who scored 23 points in the previous contest. A tactic of a box-and-one failed to yield any positive results, but a switch to a 1-3-1 defense provided the spark the hosts needed. With the switch taking place with three minutes to go in the first quarter, Hellebrant started the scoring run with a runner in the lane. A few moments later, she drained a wide open three pointer. Teammate Alaina Torres’ putback prior to the end of the frame bestowed a 13-6 advantage for the hosts. Another trifecta by Hellebrant to start the quarter extended the run. Meanwhile, the Lady Trojan defense stifled Robinson enough to force her into foul trouble and to the bench. Her Bruton teammates couldn’t make up for her scoring as they missed several open shots. Meanwhile, New Kent continued to turn the defensive momentum into an offensive explosion and claimed the win. After the contest, Burson spoke about preparing to slow down the Bruton standout prior to the contest. “I saw that Robinson had 23 points and 15 rebounds in the previous game and I knew she couldn’t come in and do that on us,” the victorious coach said. “We implemented a box-and-one and that got her frustrated and led to foul trouble. Hellebrant was the leading scorer for the Lady Trojans (1-1). Torres and Hailey Hundshaw both contributed nine points, Natasha Lange pitched in with five, and Madison Foley chipped in with two points.